JANUARY 12, 2016 (Burlington, VT): Last month, digital audio effects creator Soundtoys offered customers the opportunity to name their own price. Each week, during their Give a Little, Get a Little holiday promotion, a different plug-in was offered up, and 100 percent of the proceeds were donated to charity. Thousands of producers, engineers and recording artists participated, raising $220,218 to benefit the Migrant Offshore Aid Station (MOAS) to help save lives of refugees and asylum seekers at sea. This isn’t the first time Soundtoys has done something charitable, but it is by far the most successful. “Though we are headquartered in Burlington, Vermont, USA, our users are international. As the leader of a rapidly growing, and global company, it’s important to me that we demonstrate generosity and compassion worldwide,” said Ken Bogdanowicz, founder, CEO and lead designer of Soundtoys. Soundtoys paid for all the expenses of the campaign, and 100 percent of the proceeds were donated to MOAS, an independent, non-governmental, search and rescue organization that saves lives on the world’s deadliest migrant routes. Since their inception, MOAS has rescued nearly 12,000 men, women and children fleeing violence and oppression. “We wanted to respond to the ongoing humanitarian crisis brought about by war and unrest in the Middle East. We chose MOAS because it’s a humble, yet ambitious organization that is focused, direct and doesn’t discriminate. We believe our donation will truly make an impact. Most importantly, we share MOAS’ core belief: No one deserves to die at sea,” said Bogdanowicz. Soundtoys offered effects plug-ins Little Radiator, Little PrimalTap, Little MicroShift and Devil-Loc – each valued at $79 – for which thousands of customers made donations ranging from $1 – 10,000. “We felt ‘Pay What You Wish’ was a powerful opportunity to give customers something they value and engage them in our philanthropic vision,” said Bogdanowicz. Soundtoys has a strong philanthropic history. In addition to supporting local nonprofits in their hometown of Burlington, Vermont, and providing sponsorship for a number of music festivals and creative events, Soundtoys has hosted charity sales, wherein 100% of sales were donated to nonprofit relief organizations. On November 8, 2012, Soundtoys raised $38,384 to support Team Rubicon’s Super Storm Sandy Relief effort following the devastation of Hurricane Sandy in New York, New Jersey and along the US eastern seaboard. Previously, on July 15th, 2010, Soundtoys donated 100 percent of sales to the Gulf Restoration Network, who provided assistance to the people, wildlife, and wetlands affected by the BP oil spill. MOAS is built on the belief that no one deserves to die at sea, and is dedicated to providing specialist assistance to those in distress using their search and rescue vessels, humanitarian drone capabilities, rescue launches and specialist team of rescuers and medics. 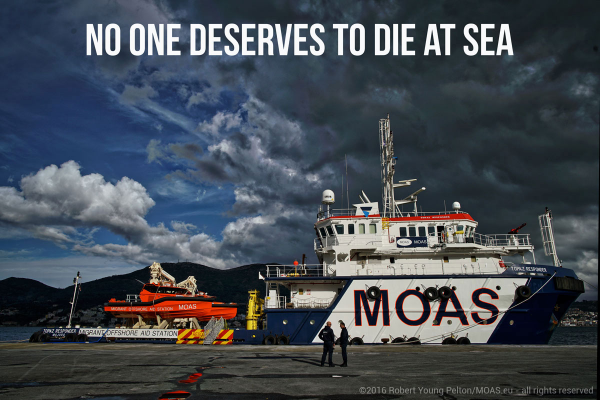 MOAS is 100% privately funded, relying on the generosity and support of private citizens and organizations to help it keep its international operations in the Central Mediterranean, the Aegean and Southeast Asia afloat. With 91% of funding channeled directly into operations, MOAS’ supporters and donors continue to save lives with each contribution made. It is a registered charity in Malta (VO/0939), Germany and has 501(c)3 status through a charity partner in the US.